Lock in a great price for Palladium Business Hotel – rated 8.6 by recent guests! Front desk/reception staff are professional and helpful with suggestions and advice for sightseeing, shopping, restaurants, etc. Daily room freshening and cleaning was well done. Room and bathroom were spacious. Breakfasts were good, plentiful and appeared to be typical Uraguayan breakfasts. Free rental bikes were a big plus especially given the proximity of the hotel (within two blocks to the 22 kilomenter Rambla (seaside walkway). Close proximity to major shopping centre (Montevideo Shopping Centre), beaches, and many good restaurants. Easy public bus rides to the Old Town. Staff exceptionally friendly and competent. Breakfast is one of the best in this price range that I am aware of. Rooftop pool and terraza is a wonderful amenity although be advised the pool is NOT heated and the water temperature can be a bit of a challenge absent the sun. Room quality more than adequate -- king bed, good water pressure, excellent hot water, good climate control, quiet, safe facility. I really like this place!! Pleasantly surprised with how much I liked this hotel -- quiet, clean, good hot water and pressure, good wifi, breakfast was above-average imo, nice view from upper floors, rooftop pool and deck, friendly, attentive staff -- nice place all in all. Location is good, rooms are spacious. Big shopping center and several places to eat and drink in the vecinity. This time it was very good! Nice clean room, bathroom looked brand new. We'll come back! The breakfast was good, had a variety of options. 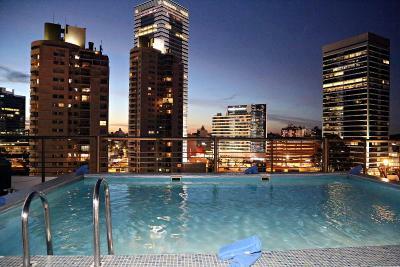 The location was good since I had to work in the WTC towers and the hotel is 2 blocks away. Spacious room, bidet on bathroom, friendly staff, fair number of options for breakfast, frigobar on the room, possibility to schedule tours by frontdesk (we did a winery tour, paying at hotel with no future worries). Walking distance from a mall (with supermarket in premises). The bed was so comfortable and the breakfast was great. Also lovely to sit by the pool and cool off! Such great value for money! Palladium Business Hotel This rating is a reflection of how the property compares to the industry standard when it comes to price, facilities and services available. It's based on a self-evaluation by the property. Use this rating to help choose your stay! 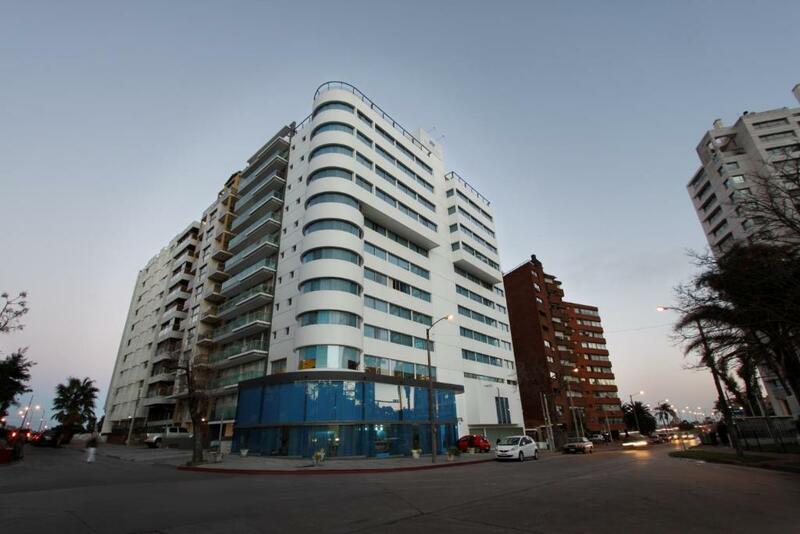 One of our top picks in Montevideo.This 4-star hotel in Montevideo is located near the new Zona Franca and offers a rooftop terrace with city views. Free Wi-Fi is available. Carrasco International Airport is a 15-minute drive away. Rooms at the Palladium Business Hotel have classical-style furnishings and include a cable TV, mini-bar and an private bathroom. The Corner Suites have a hydromassage tub and a spacious work desk. 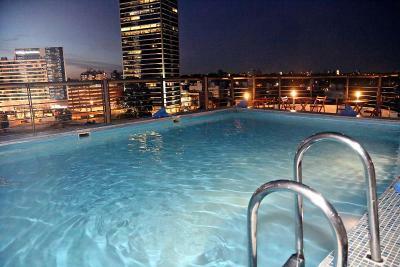 Guests can go for a swim in the outdoor swimming pool, or work out in the well-equipped gym. Laundry, dry cleaning and ironing services can be arranged for an extra fee. Buceo is a great choice for travelers interested in beach walks, coastal walks and food. 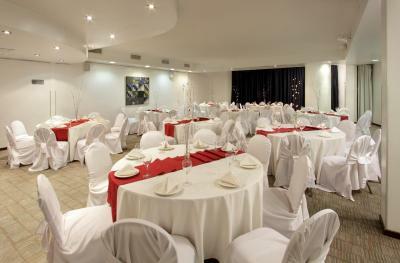 When would you like to stay at Palladium Business Hotel? This suite features a king-size bed, LCD cable TV, air conditioning, private bathroom, workdesk, mini-bar, and safety deposit box for laptops. This suite features a king-size bed, LCD cable TV, air conditioning, private bathroom, hydromassage tub, hairdryer, workdesk, mini-bar, and safety deposit box for laptops. This room features a queen-size bed, LCD cable TV, air conditioning, private bathroom with hairdryer, mini-bar, and safety deposit box. This room features 2 double beds, LCD cable TV, air conditioning, private bathroom with hairdryer, mini-bar, and safety deposit box. This family room has a mini-bar, seating area and cable TV. Hotel surroundings – This neighborhood is a great choice for travelers interested in beach walks, coastal walks and food – Check location Great location - show map Guests loved walking around the neighborhood! House Rules Palladium Business Hotel takes special requests – add in the next step! Palladium Business Hotel accepts these cards and reserves the right to temporarily hold an amount prior to arrival. Bikes should have been better maintained but they did the job with a few adjustments. Would have liked two pillows each on the bed. The water in the pool was too cold for me to get in, but it was also a little bit chilly/windy the day I was there. However, the roof top is still a great place to hang out and it allows you to get a sense for where everything is. I was very happy about the nice bikes that they let us use for free! 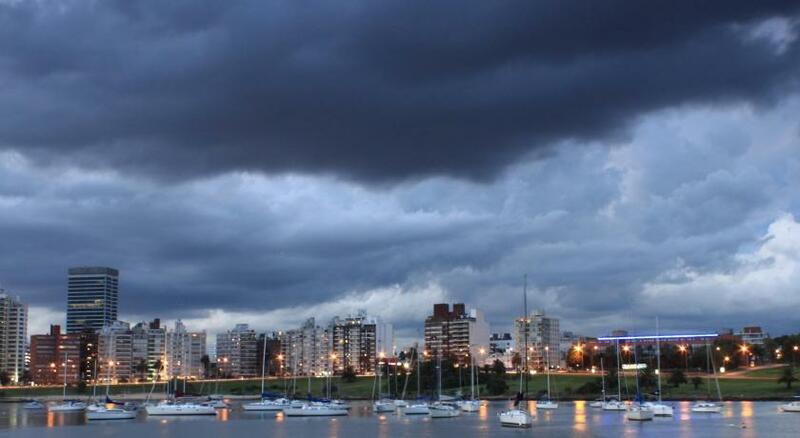 It makes getting around Montevideo so easy and allowed us to see so much of the city. We were able to bike all the way from the hotel to the Old Town along the water front, which is also called "La Rambla". It was so nice, biking around Montevideo was one of my favorite parts of my trip! First days I was put in a smoking floor. Had to insist the staff for two days to change the room. The matress needs to be changed, you can tell there old, the carpets needs to be cleaned, replaced or removed. - we’ve had a top deal, the stuff was friendly, the hotel really nice after some time in hostals around South America. The stuff was nice, everything was working great, good breakfast, we’ve enjoyed the pool and the ac after sweating for a while days before. Nice but kind of old swimming pool (tiles need some maintenance). Breakfast wonderful, very good coffee. The bed was very comfortable, AC worked well. The hotel lounge was very cosy.